It's been too long since I lasted posted. 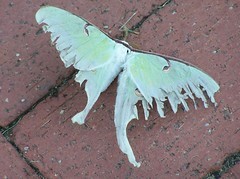 Today I came across this beautiful Luna that lay dying on the walkway. Even though it was badly battered, it was icredibly beautiful. As I took photos, I found myself wondering what thoughts, if any, were going through its mind as it expired. Yes, I do believe that like us, insects and other lower life forms understand what is happening to them. I also wondered how this Luna came to be so battered. Was it the plaything of a local dog or cat? Was it caught unuaware as the ground crew was working? Sad to see such beauty go.